A new study by biogeochemists and glaciologists at Woods Hole Oceanographic Institution (WHOI) identifies a unexpectedly large source of iron to the North Atlantic—meltwater from glaciers and ice sheets, which may stimulate plankton growth during spring and summer. This source is likely to increase as melting of the Greenland ice sheet escalates under a warming climate. Iron from wind-blown dust and river runoff fuels annual plankton blooms in the world’s ocean. Ice sheets and glaciers are now also thought to contribute iron from sediments on the bottom of calved icebergs and glacially-derived dust. Until now, meltwater runoff from glaciers and ice sheets was considered too dilute to carry much iron, although previous research has shown a strong correlation between the plankton blooms and the runoff from Greenland ice sheet. During the course of two expeditions to the Greenland ice sheet in May and July 2008, Bhatia and her colleagues collected samples from sites at several land-terminating glaciers on the western side of the Greenland ice sheet. 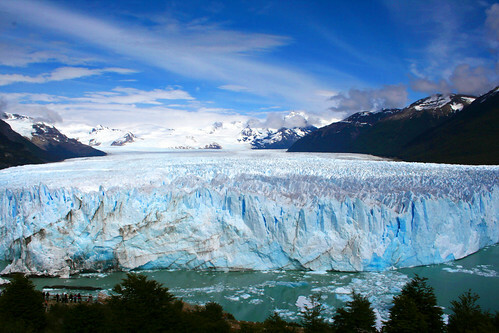 The glaciers’ meltwater empties into a large lake, which eventually drains into an estuary system before reaching the open ocean. Their study reports levels of dissolved iron orders of magnitude higher than previously found for Greenland glacial runoff rivers. When the WHOI team extrapolated their findings to calculate the contribution of iron from the entire ice sheet, they estimated its value to be within the range of that from dust deposition in the North Atlantic, which is believed to be the primary source of bioavailable iron to this ocean. This value is only an order of magnitude lower than the estimated annual contribution of iron from rivers worldwide. When an ice sheet or glacier melts, most of the water doesn’t simply run off the surface of the ice sheet. Instead it first drains to the bedrock below the ice sheet through cracks and conduits called moulins and then exits in large runoff rivers. “A lot of people think of a glacier and an ice sheet as a big block of ice,” says Bhatia, “but it’s actually quite a porous, complicated system underneath a glacier, with lots of moulins and crevasses leading to the bottom. Once you get into the bottom, there are large tunnels that these waters are passing through.” The more time the water spends in contact with the bedrock and sediments beneath the glacier, the more nutrients it picks up, including iron. The WHOI team says further research is needed to determine how much of this iron actually reaches the open ocean, as their study followed the meltwater from the edge of the glaciers to the large lake they empty into. For this study, the team assumed that the amount of iron filtered out as the water moves through estuaries before reaching the marine environment would be roughly the same for glacial systems as it is for river systems. The researchers hope to do more work to confirm the study’s numbers by sampling over a larger geographical area. Additional research could also confirm whether this influx of iron is in a form that can be easily utilized by phytoplankton and therefore stimulates primary production in the ocean. Maya Bhatia is currently a postdoctoral fellow in the Department of Microbiology and Immunology at the University of British Columbia in Vancouver, BC, Canada. Her co-authors include Elizabeth B. Kujawinski, Department of Marine Chemistry and Geochemistry; Sarah B. Das, Department of Geology and Geophysics; Crystaline F. Breier, Department of Marine Chemistry and Geochemistry; Paul Henderson, Department of Marine Chemistry and Geochemistry; and Matthew A. Charette, Department of Marine Chemistry and Geochemistry, all of WHOI. This research was supported by the WHOI Clark Arctic Research Initiative, the National Science Foundation, the WHOI Ocean and Climate Change Institute, and an AGU Horton Hydrology Grant.